+WR4U wax/resin thermal transfer ribbons have been developed for high-volume printing processes at high speeds. Suitable substrates are paper, various plastics and flexible packaging foils. 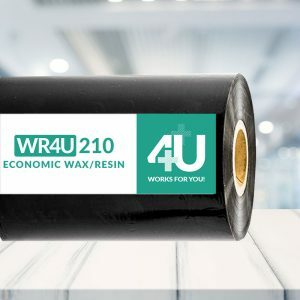 +WR4U 200 Premium Wax-Resin barcode ribbon is a premium wax-resin ribbon that provides outstanding print quality in a variety of environmental conditions on paper, many synthetic materials, a variety of coated paper, and matte synthetics. +WR4U 210 Economic Wax-Resin barcode ribbon is affordable and of a very good quality. It is possible to print high quality barcodes on both coated and uncoated paper labels for different purposes with speeds up to 300 mm / sec. +WR4U 220 Ultra Premium Wax-Resin ribbon is the best choice for labels that needs to meet more extreme environments. An ideal thermal transfer ribbon for labels requiring long lasting images.